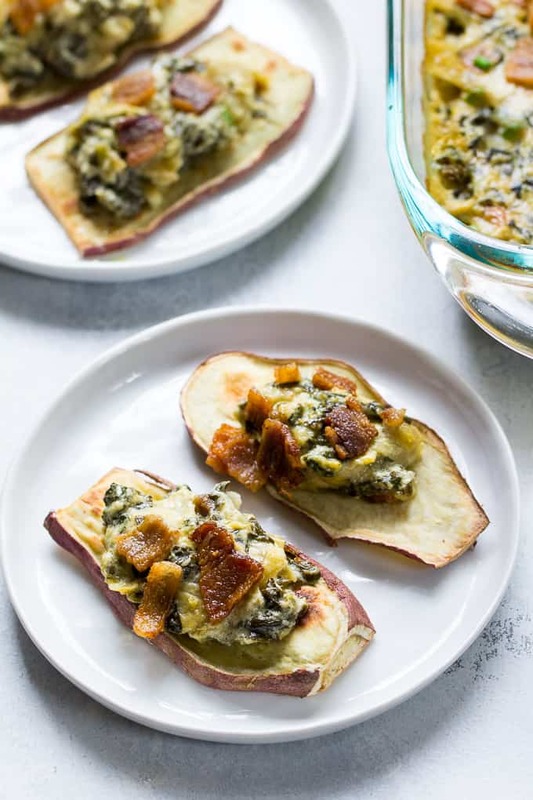 Creamy Baked Spinach Artichoke Dip that you won’t believe is dairy free! 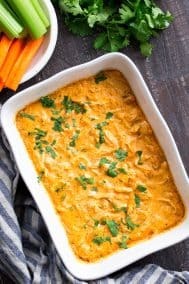 Super creamy and packed with flavor, this dip is great for veggies, chips, and as a topping or spread for potatoes, chicken and burgers. Paleo & Whole30 compliant. We have had entirely too many rain days, AKA bad-photo days for me lately. 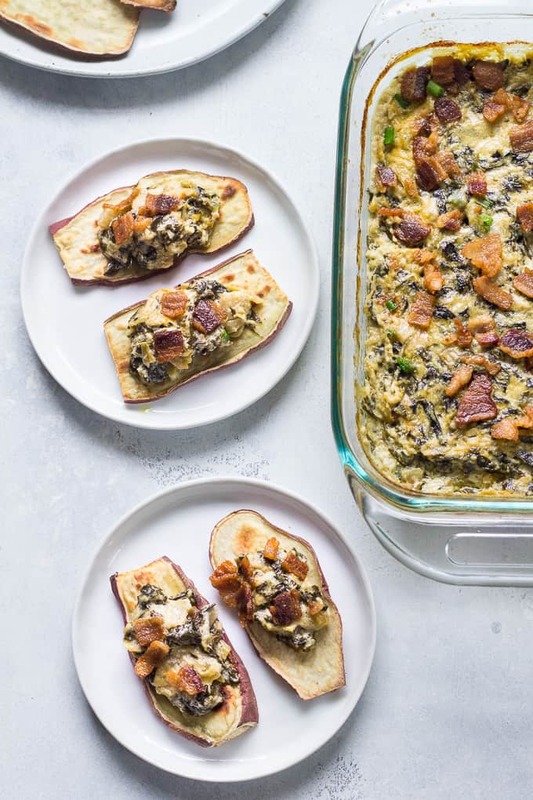 In fact, I almost delayed posting this yummy spinach artichoke dip recipe because of it. Adam came home from work and heated up his dinner (which happened to be a burger and sweet potatoes topped with some of this dip) and then witnessed me obsessing over my recipe photos to the point of near-tears because I was convinced that I needed to re-make the recipe on a sunny day to get better photos. He checked out the photos, said they were fine, and asked me where the recipe was so he could take some for breakfast the next day. And, he then asked me what exactly he was eating because “the topping is really good.” Yup, this actually happens quite often. I told him it was spinach artichoke dip, you know, from the same batch of spinach artichoke dip that we’re looking at on the screen right now. 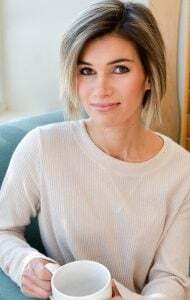 He thought it was another breakfast casserole – I think that’s an honest mistake. 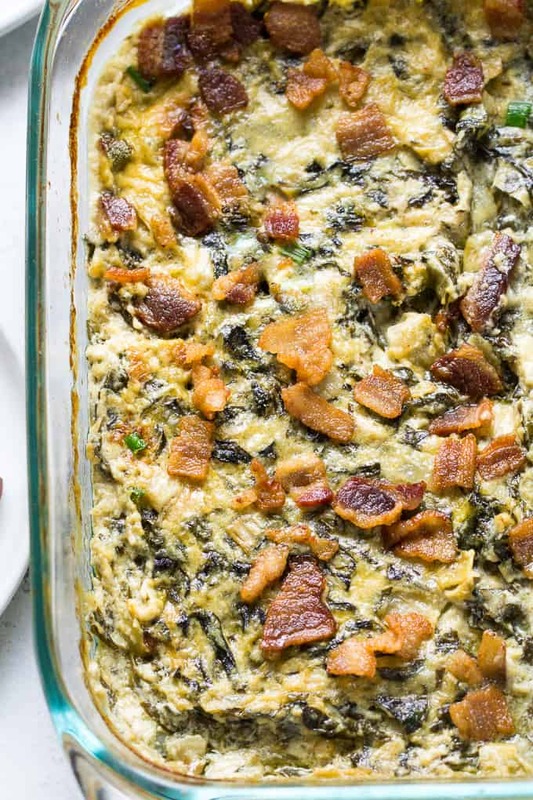 Of course now that I’m writing this, the idea of a spinach artichoke breakfast casserole doesn’t sound half bad. But anyway, after making the connection, he told me that I definitely don’t need to make it again because it’s delicious and the pictures are fine. And really the last thing I needed at that moment was another disappointing photoshoot with this dip, plus another huge batch of dip. Even if we both ate it for every meal for 5 days straight, we wouldn’t put a dent in batch number two. And now, my rainy-day-dip sob story comes to a close. The “creamy” base of this dip tastes downright cheesy, thanks to a mixture of coconut cream, paleo mayo, nutritional yeast, lemon and spices. It does separate a bit when you bake or reheat, however, I easily re-combined by simply mixing with a spoon. 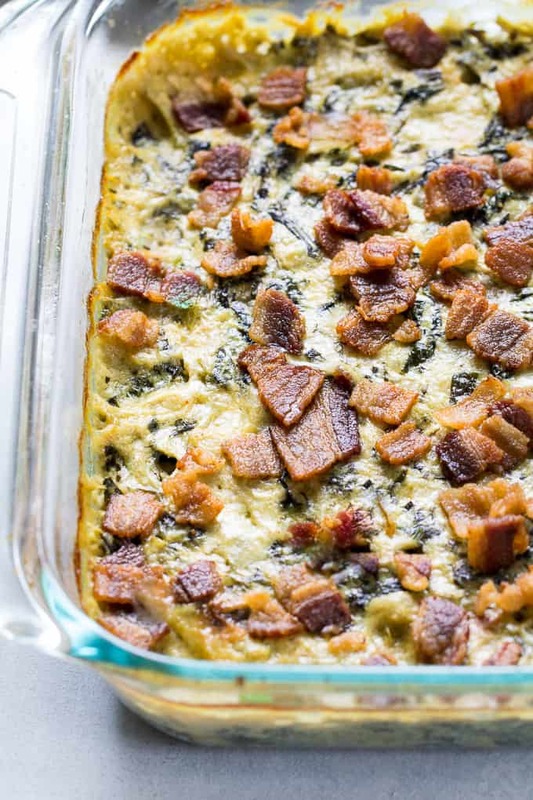 It’s thick and creamy, packed with flavor and – yup – topped with bacon! 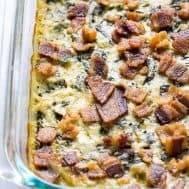 This part is optional of course and I guarantee you will love this baked spinach artichoke dip with or without bacon. 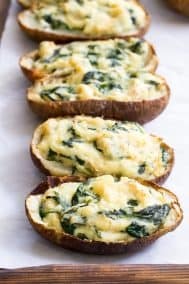 One last note – I used fresh baby spinach, however you can just as easily sub frozen, thawed and drained spinach here without a problem. Ready to start? Let’s go! 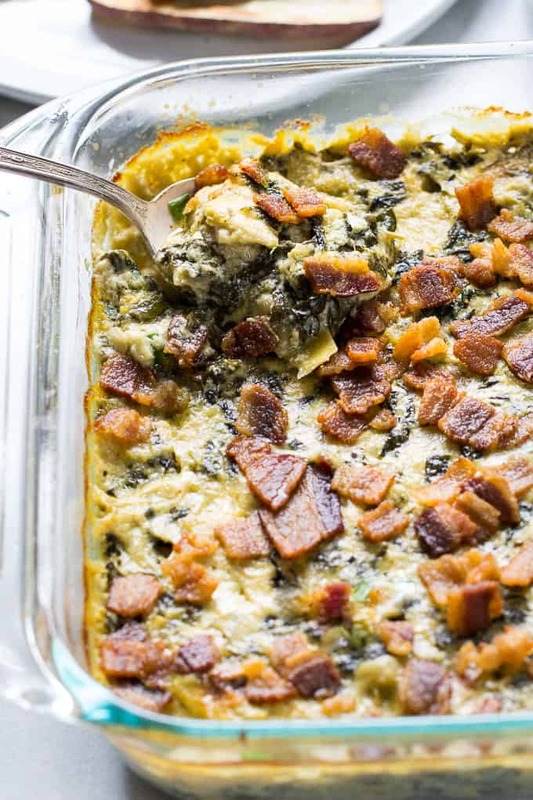 Creamy Baked Spinach Artichoke Dip that you won't believe is dairy free! Super creamy and packed with flavor, this dip is great for veggies, chips, and as a topping or spread for potatoes, chicken and burgers. Paleo & Whole30 compliant. Pre-heat your oven to 400 degrees. Heat a large skillet over med heat and add the ghee. Add the chopped onions, sprinkle with salt and cook until soft. Then, add the garlic and continue to cook until just softened. Once garlic is just softened, add the spinach and sautée until wilted, then add artichokes. Cook for a minute longer, sprinkle again with salt, then remove from heat. For the "cream" mixture, in a large bowl combine coconut cream, mayo, lemon juice, onion powder, cayenne, nutritional yeast, 3/4 tsp salt. 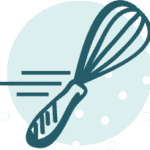 You can whisk together well or use a hand blender to combine until creamy. Add spinach mixture to the bowl, discarding any excess liquid left in the skillet. Mix well and transfer to an 8x8" baking dish. Bake 15-20 minutes in the pre-heated oven or until heated through. 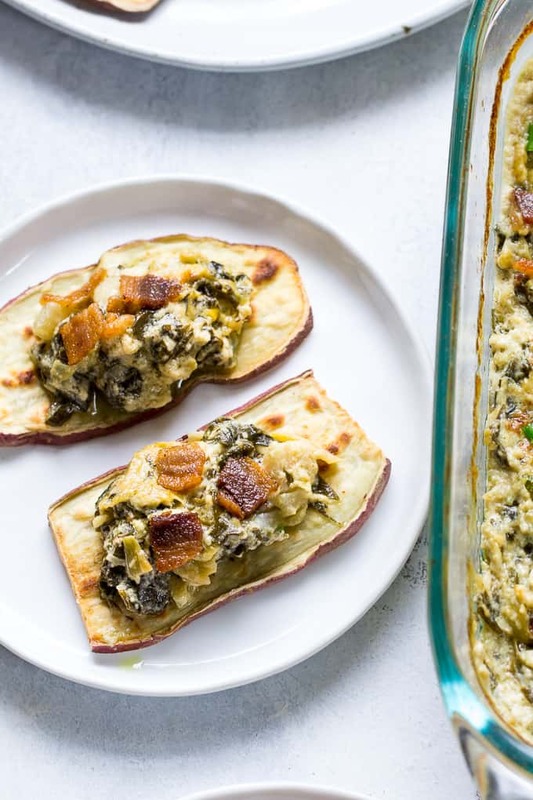 Remove from oven and immediately top with crumbled bacon. 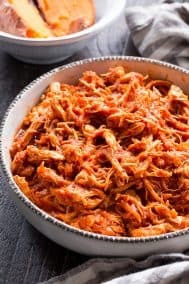 Store dip in a tightly covered container in the refrigerator for up to 5 days and re-heat as desired** You can also serve leftovers as a cold dip as it will keep a thick, creamy texture. *The cream will be hard, so blend or whisk well before using. You can also use the equivalent of about 2/3 cup of canned coconut cream which you'll also need to blend. **If the dip separates, simply mix gently with a spoon to re-combine. Want more delicious, versatile Paleo dips? Try one of these! Ever cook things that your family loves, yet they have no idea what they’re eating? 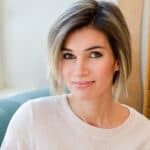 If you’re doing a Whole30, is it changing your taste for different foods? the weather has been horrible! glad the sun is coming out today. my son will eat nothing that I make unless he knows what it is. and even then, its unlikely he will eat it lol. gotta love the teenage years right now. I guess rebelling against food isn’t the worst thing to rebel against, lol. Still annoying though, for real! I’ve never tried nutritional yeast, but another of your recipes that I made called for it as well. However, it was a different brand that this one. Is there a difference between them and which one do you prefer. 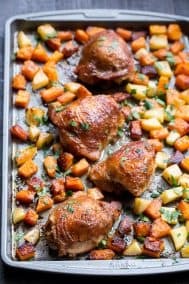 My son “hates” chicken but loves the nuggets I make him haha When he asks me about it I just change the subject 😉 I’m only on day five and although I didn’t eat much sugar before, I found everything with natural sugar in it (ex: sweet potatoes and butternut squash) way sweeter than I used too. It’s pretty amazing how tastes change. At this point almost everything tastes sweet to me, including raw nuts which is definitely pushing it, lol! Changing the subject a bit but have you tried veggie nuggets with your son? Drew who’s 5 won’t touch veggies right now and I’m desperate for ideas that might work! Unfortunately I’m in the same boat with my 7 years old. He will eat carrots with hummus and sometimes pureed sweet potatoes or butternut squash (but he always complains about it and will only take a few bites). I have been successful hiding tiny pieces of onions and peppers in burgers and pasta sauce. He also likes tomato soup so I hope it counts 😉 Even fruits is difficult in my house : he eats apples and avocadoes and sometimes red grapes but every else is a constant fight. Feeding kids is an extreme sport ! Let me know if you find things that work for Drew! I’m thinking of going the hiding route since all he eats right now are sweet potatoes and the tops off of roasted broccoli! I’m pretty much a fan of anything with spinach and artichokes. If it comes in dip form, even better. I think the pictures came out beautifully. Can you substitute something else for the mayo (i just don’t mayo!)? Maybe extra coconut cream? Have you tried homemade mayo? I never liked bottled mayo AT ALL but the homemade version is very different. That said, with this recipe, you don’t really taste the mayo but it does add to the creaminess and flavor. If you want to try it with all coconut cream I think it would be fine, however I’d recommend increasing the lemon by a couple of tsp as well as adding some onion and garlic powder since you’ll lose the flavor from the mayo. You can taste before you bake and add what you need to suit your taste. Do you know approximately how much coconut cream you used? I just buy canned coconut cream at Trader Joes and scoop as needed. Thanks! Made this for a small get-together tonight. I doubled the recipe thinking that I could use the leftovers later in the week. My mistake, no leftovers! It was delicious, a definite “do-over”. So happy you liked it, bummer no leftovers, haha! I haven’t done it so I’m not sure about the time, or if the coconut milk would separate. What can I use in place of nutritional yeast?? You can simply omit it without missing out on much. This dip is fantastic!!!! We love It! Thank you for this recipe. I’m going to try out this dip for a girl’s night in! Please tell me about my”chip” options. Sweet potato chips or “toasts”, plantain chips or tostones (twice fried plantains) or just raw veggies would be good with this dip! 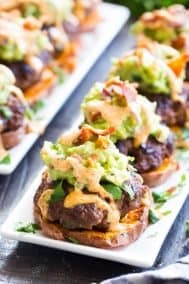 How do you make your sweet potato chips or “toasts”? Just slice thinly, olive oil, salt, pepper and pop in oven? Dip is DELISH!! I am really missing chips though, since my kids are eating them in my face. Help! Pretty much just like that! I’d use a 425 oven and bake until crisp, flipping once. The recipe only says 3/4 fine sea salt. 3/4 what? Tbsp? Tsp? Thanks! It’s tsp, I’ll update that now! I’m making this for a dinner party this evening. Can I make it in advance and then reheat it? Obviously I won’t top it with the bacon until it’s time to serve. Excited to try this, Michele! Yes you can, sorry for the late response and hope it worked out! 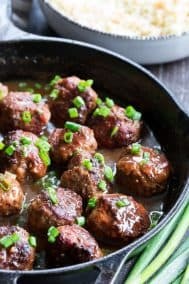 This has to be a weekend recipe for me (my prep time was at least 35 minutes), but it’s worth the time! 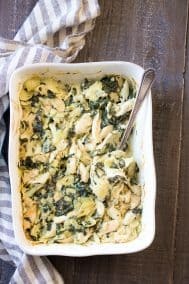 My husband says it’s virtually indistinguishable from the standard baked spinach artichoke dip, and I agree! 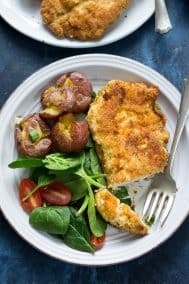 I served it over chicken breasts that I had baked on the same pan I had used to bake the bacon, so that added a nice depth of flavor. When I’m not on a Whole30 round (as I am now), I look forward to making this again and dipping crackers in it.